Maria joined Quiroga Law Office in June 2016 and began practicing Immigration law. She was born and raised in Bogota, Colombia. Maria immigrated to the United States with her parents in pursuit of the American dream as a young adult. Maria overcame the language and culture barriers to be able to attend college. She graduated with honors from the University of California Los Angeles in 2011 with a degree in Political Science. Maria then obtained a juris doctor degree from Loyola Law School Los Angeles in 2014. During law school Maria externed at the United States Bankruptcy Court in Los Angeles with the Honorable Julia Brand. She also participated in the Juvenile Innocence and Fair Sentencing Clinic. There she assisted in the representation of persons who have been wrongfully convicted and youth who are sentenced to unjustly disproportionate adult prison sentences. 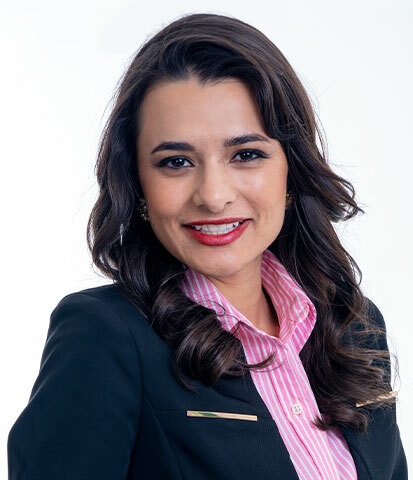 Prior to joining the firm, Maria was the judicial law clerk to the Honorable Adriana Escobar in Department 14 of the Eighth Judicial District Court in Las Vegas, Nevada from 2014-2016. During the two years of her judicial clerkship Judge Escobar had a full civil docket, a criminal docket, and the Specialty Courts (Mental Health, Drug Court, Felony DUI, Veterans Court and O.P.E.N). Ms. Quiroga is currently a member of the Latino Bar Association and the Howard D. Mckibben American Inns of Court.